The Pallid bat is a very pale, sort of buff colored bat that reaches a smaller size, weighing about an ounce, but will also have a wingspan that is as much as nine inches across. 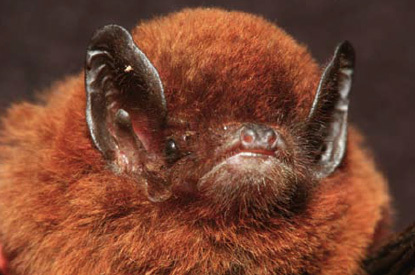 They have larger ears and eyes than most bats in North America, but like all bats, their hands and arms are modified somewhat to form wings with which they sail through the air. 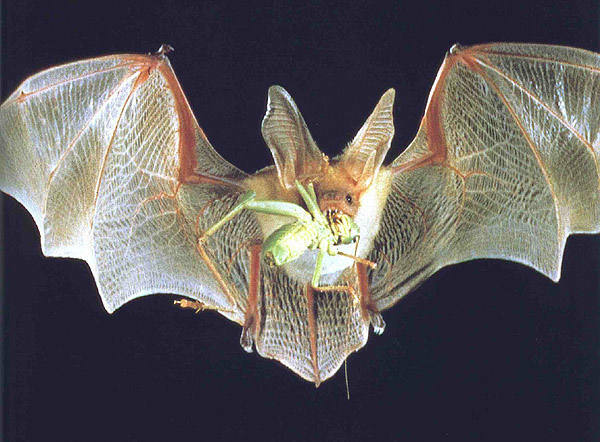 The arm and hand bones form the frame of the wing, and a double layer of skin forms the wing membrane. Pallid Bats are found in the western United States spending their daylight time in crevices, canyon walls or in older abandoned buildings, where they will sleep the day away. During the winter, most Pallid Bats hibernate in deep crevices in canyon walls or deep in caves where the temperatures are cool and constant. One of the most incredible things about the bat is its method of navigation, and finding food, which is more or less a system of echolocation. A bat can voice a sound so high in frequency that humans cannot hear it. When the sound hits an object, for example an insect such as a fly, the sound bounces off the object and the bat hears this echo. From the echo, the bat can determine a great deal about the object in front of it.. Such as the shape of the object, the distance, the motion and the direction that it is traveling, as well as the size and shape of it, so that it will know whether or not the thing which has echoed back to it is suitable food. Scientists believe that a bat can detect a single human hair dropping to the ground in total darkness using only its echolocation. The Pallid Bat has much larger eyes and most likely far better eyesight than its relatives in the bat community. Pallid bats primarily eat insects which they pluck from the air using the echolocation tactic to find them. They will mate in the fall of the year, but the female will store the sperm in her reproductive organs until springtime when she will permit the eggs to fertilized. She will then give birth to one, sometimes two, offspring early each summer within a maternal colony deep in a canyon crevice. The maternal colony is usually a very warm place that remains a constant temperature. The little bat is blind and naked when born and will cling to the mother, nursing during the entire day. At night, while mother is out feeding, the youngster hangs on the crevice wall waiting for mother to return. Maternal colonies can include up to 200 females and young. The small bats will be flying at about six weeks old, and hunting for their own food shortly afterward. 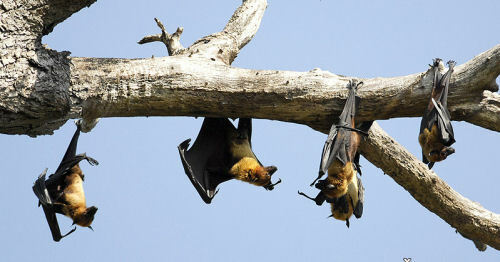 Male bats do not roost in maternal colonies but will find their own daytime roosting spots. These roosts are usually much cooler then the maternal roosts. The coolness of the male day-roosts allows the males to preserve their body energy by going into a sort of mini hibernation, called torpor.